Endless Art US presents the future of the gift box. No more searching for wrapping paper, ribbon, or tape to wrap your gift. It is an all in one solution for your gifts. These elegant gift boxes enhance and transform your gift into a beautiful presentation. Our trendy designs add a personal touch to the gift box. The "EZ Gift Box" comes flat fitted in its solid lid with a gift tag and tissue included. Its clever patented design enable a simple and an instant pop up gift box, becoming a beautiful gift in seconds. With the Cassandra Collection you will have a wonderful and joyful experience when giving a gift. Rich pastel boxes enhances with white swirly designs along the sides and top. Comes in turquoise, lavender and orange. The white satin bow mounted on the lid adds elegance to the box. Come with and elegant satin bow attached to the lid and include tissue paper and a gift tag. 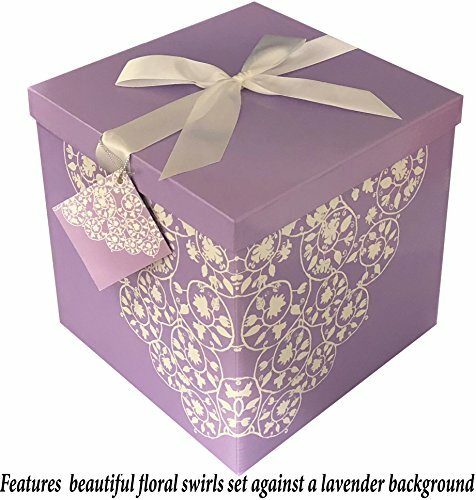 Reusable gift box that pop up instantly to become a beautiful gift in seconds. Comes flat, No need for excessive space to store away. Perfect as a beautiful storage container. Can hold up to 10 Pounds!! If you have any questions about this product by EndlessArtUS, contact us by completing and submitting the form below. If you are looking for a specif part number, please include it with your message.